Blacked out memories are often signs of trauma. My childhood consists of many blackouts. I guess there were events in my life that my mind chose to shield from me. If these events are worse than the memories I do have, I am grateful for the mercy. As disturbing as that sounds, I must add that my parents loved me very much. Even as a child, I knew they did. And they had beautiful qualities I was lucky enough to learn from. The problem was, the love they had for me wasn’t strong enough to overcome the madness they were trying to escape. My mom wasn’t able to choose me over her thirst for the bottle, and my father wasn’t able to always put my well-being above the anger he held toward my mom’s addiction. That resentment grew into domestic violence which I tried to shield my mom’s drunken body from with my own. Most of the time, I failed and felt shame for doing so. I wish I could tell you I’m okay with that, but that would be a lie. However, what I can tell you is that my parents’ actions have lead me to where I am today, hence why you are reading this bio. 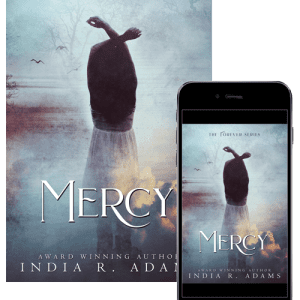 I am India Rigmor Adams, and I am an author. 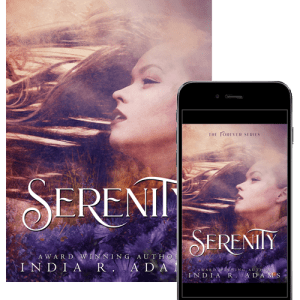 The first novel I wrote, Serenity, is partly my story, but I gave that innocent girl a much better chance of survival. The truth is, sometimes, too much to bear. In between my mother’s drinking episodes and my father’s rage, she had me deeply involved in the arts, a dream she had been denied as a child. Her dream began with ballet. I wasn’t fond of being struck with a ruler by the Russian teacher who had a very strong accent, so I didn’t try very hard. My failure didn’t deter my mother’s obsession with dance. Therefore, I was part of an adult Mexican Folkloric group by the age of 7 or 8. Mom was so excited for my first upcoming performance she sewed me a yellow traditional Mexican costume (because a seamstress was the career her parents had chosen for her), and a green one for whom I’d been practicing with. Unfortunately, this child (my partner) decided performing in front of the large audience was not happening. Her mom allowed her to back out. Mine did not. I ended up doing a solo. This solo performance started a career in dancing that didn’t end until after delivering a child of my own. The only aspect of the musical theater world I did not appreciate was the intense schedule that came along with it. Doing little plays was not enough for my mother. Once I was in middle school, it was time to broaden my horizons. There was a dinner theater down the street from her performing arts center, and I was dragged in for an audition. Poorly prepared, due to my mom being too busy running her restaurant (where I was a waitress by the age of 12), I bombed the audition. I had failed, in my mind, so epically that this incident placed a deep scar on my self-esteem. That scar remained, even though I was later hired for the musical production, South Pacific, and was technically now a professional. Against the advice of my teachers, the principal allowed my mom to pull me out of school so I could do all the South Pacific performances required each week. My teachers were concerned because I was already behind the other students due to learning disabilities. Not until being a mom myself did the school systems start having a greater understanding of those issues and how they affect children. The cast and I did matinees and evening performances every day except, if I remember correctly, on Mondays. That was the day I was to actually go to school, turn in homework to teachers, and grab the following week’s assignments. I never turned in anything of value, if anything at all, and slowly fell through the cracks. My mom should’ve yanked me out of the local theater (that eventually closed down) and demanded I improve my grades. But she didn’t. She even allowed me to be in the next running show, Finnegan’s Rainbow. It took many years into adulthood for my ‘angry’ stage of healing to finally appear. Maybe that is because it wasn’t until the third grade, when I was put in a temporary foster home, that I even realized something might be off about my childhood. It wasn’t until a judge asked me what I wanted that I knew how much I appreciated having a choice. That choice? I was a child who wanted desperately to go home. To adults who have an understanding of abuse and what it looks like, it’s hard for them to understand why an innocent wants to return to the chaos, but the truth is, it’s all I knew. It’s all most kids from abusive homes know. I hold no grudge against whatever adults or school system had my family investigated; they were trying to save a little girl who was drowning. But the blisters on my hands, due to the strangers I was forced to live with, was too foreign and complicated. My mind was still spinning from being taken from school, without my parents’ knowledge, by other strangers telling me my mommy wasn’t being a ‘good’ mommy due to her drinking. Fortunately, the judge listened to my request and allowed me to return home after I made him a promise. I was to call a certain family friend whenever my mom started drinking again so that I would not have to be subjected to her alcoholism (The judge, the adults trying to save me, and HRS were unaware of the domestic violence, and I refused to tell in fear of being removed again). I was surprised to learn that this family friend, one I adored dearly, had applied to the government to become a foster parent for only me. When my mom would start drinking, I would literally skip to the phone and call this wonderful woman because I loved the schedule she kept me on when I was with her. I craved the cut-up fruit that was always available for me. I treasured the dinners she would cook, so I didn’t have to stand on a chair in front of the stove and feed myself. My ‘Otha Motha’ as she was affectionately referred to, had a gorgeous teenage daughter that I would’ve followed anywhere. She and her Italian boyfriend would pull up in my driveway, if Otha Motha was at work, and scoop me up as if I wasn’t intruding in on their romantic bliss. Their young hearts were beyond their years and wide open to me and made me feel special… until the day she died her senior year. After that loss, my Otha Motha was too heartbroken to stay in a town where, everywhere she turned, there were memories of her only child. I never, not once, held a grudge for my foster parent moving back to her home state. I was young but already so sensitive to energy that I sensed her pain even though I had no concept of the love a mother has for a child. And I sensed how the young man who loved her daughter was dealing with an unconceivable broken heart, and how seeing me was too painful of a reminder of what would never be. After the gut-wrenching funeral, I never saw him again. Without my guardian angels, my life became… well, that’s where my books come back into the picture. Vultures sense the dying and they swoop in. My vultures didn’t wait for my death. They each took a turn and a bite while I was still alive and exposed. And every bite altered me, my heart, my soul, and how I would handle the next attack. In attempts to overcome all the tragic events I’ve experienced, I wrote for eight years before ever publishing one manuscript. In that process, I realized there are most likely many survivors like me, and I desperately want them to know they are not alone. That’s why, in every song, poem, book, novella, or novel I have written or write, there are pieces of me; pieces of my past and hopes for the future, and many wishes for what could’ve been, as well as my regrets for what was. I may not speak of all these pieces—share with readers which ones are truly mine—because some are too gruesome. Some truths could hurt family members. Those pieces will most likely stay hidden in the characters that bring my sorrow into the light so that my heart will no longer be in the dark. Create light… and there will be no darkness.